In the Hyperglance Admin Panel i.e https://IP_address/#/admin, select the 'Amazon' Collector under the 'Collectors' section. Click on 'Add Record' button which brings up a pop up with the necessary fields (shown below). Note: Hyperglance Admin Panel is visible only to admin users of Hyperglance. You can enter in multiple user accounts into the AWS integration so you need a distinguishing keyword. Enter in a unique identifying keyword. If you plan to use Role-Based Access Control then your choice of Account Alias will decide the roles that you need to assign to your users in order for them to access this account's topology. This field is not available on Hyperglance releases from the Amazon Marketplace. 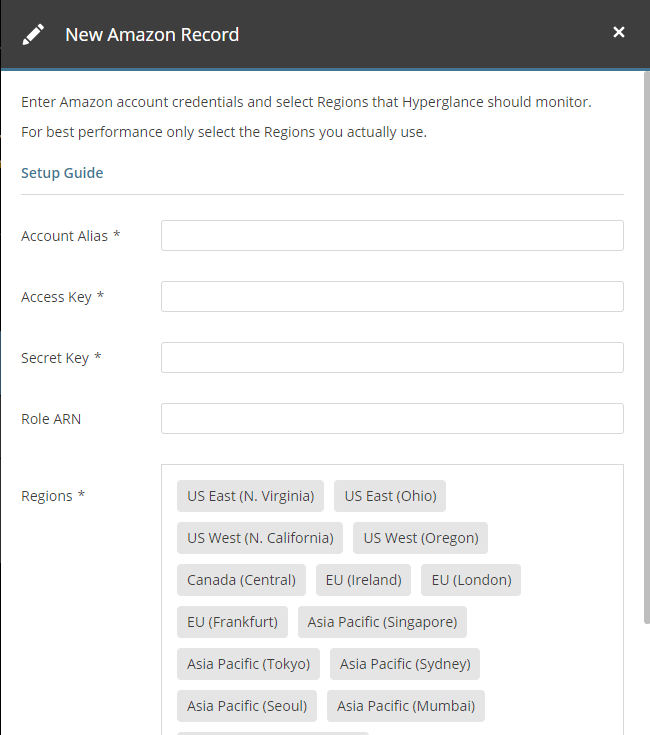 An access key associated to a user with the required permissions for Hyperglance to read the Amazon environment (see AWS permissions below). This field is optional when Hyperglance is running as an AWS Instance, if left blank Hyperglance will rely on the EC2 Metadata service to retrieve credentials associated with the IAM policy assigned to the instance. A secret access key that is used to sign programmatic requests that Hyperglance makes to AWS. The ARN of an account trusted role to use for STS AssumeRole. Use this when you want Hyperglance to make use of STS temporary security credentials. The regions you wish to visualize. Only select the regions that you use, increasing the number of regions increases the API calls to AWS and therefore slows down the collection unnecessarily. When you finish to fill the form please press on the "Submit" button. If the account was added successfully, the popup disappears and the newly added record will be listed under the records for Amazon collector. It is important to understand that the connection technique used by Hyperglance varies depending on where Hyperglance appliance is running and which connection details you have supplied to the credential form. Role ARN STS role assumption performed from the account that Hyperglance instande resides within. Access Key & Secret Key Direct connection to the base account associated with those keys. Role ARN + Access Key + Secret Key STS AssumeRole assumption performed from the base account associated with those keys. Direct connection to the base account associated with those keys. STS AssumeRole assumption performed from the base account associated with those keys. When Hyperglance runs as an EC2 Instance with an IAM user policy attached, the policy must have certain rights in order to allow Hyperglance to poll the relevant information from the API. See our AWS IAM Policy Requirements for the required policy config. Note: 'Access key' and 'Secret key' fields will not be displayed in the 'Add record' popup when Hyperglance runs as an EC2 Instance.